What if your HR Lady was Amish? I’m spending the next several days in the Lancaster, Pennsylvania area which is the home to the largest and oldest Amish community in the US. I am fascinated beyond belief. I took a trip to this part of the country a few months ago for the first time and, as luck would have it, had a few hours to spare. I was able to drive about the countryside on a personal quest to see actual Amish people driving buggies and walking up and down picturesque country roads. I popped in at a heritage center type place and stopped at an “Amish Village.” The latter was somewhat disappointing; it was clearly designed to entice tour buses full of tourists from foreign lands to spend ridiculous amounts of money on ‘handmade’ soaps and jellies/jams made in local factories. Capitalism and ‘Merica at its finest. But I didn’t mind because I enjoy exploring the history of religions and religious groups and the story of the Amish is fascinating. 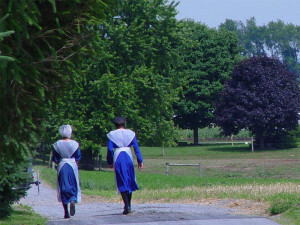 After the Reformation period (16th century) the Anabaptist movement led to the creation of three “plain” communities: the Amish, the Mennonites and the Brethren. While there are similarities, the Amish are the most conservative and have an emphasis on humility, family, community and separation from the non-Amish world. The Amish began as part of the Mennonite group (named for Menno Simons) but later splintered off, in 1693, under Swiss bishop Jacob Amman. In the early 18th century, members of this group arrived in Pennsylvania in order to escape persecution in Europe where they were being declared heretics – and put to death – by both Catholics and Protestants. These three Anabaptist groups share the same basic values and differ primarily in matters of dress, language, forms of worship and the extent to which they allow the use of modern technology/conveniences. Primary cornerstones of the Amish faith include humility, patience, obedience and conformity. There is a great emphasis placed on preserving the group identity and downplaying personal aspirations. No wonder they have to eschew modern conveniences. How would the Amish value of humility play in our world of selfies and Facebook posts? While Rumspringa may be an option for some Amish youth to head off and live amongst “the English” for a period of time not all Amish adolescents have – or take – this opportunity. And, based upon many things I’ve read, upwards of 90% of the teens that do head off and live-another-life return to the community and get baptized. Forever eschewing the world of “Keeping Up With the Kardashians,” Adele, and Zac Posen. How many organizations, despite their stated intentions to the contrary, are replicating Amish values within their organizations? Where preserving group identity (conformity) is more important than personal aspirations or desire. Where obedience (follow the rules! adhere to HR policies!) is desired above all else. Not that long ago I got a resume from an HR professional who stated he was responsible for ‘New Employee Indoctrination.” And, believe it or not, in this day and age of personal branding and authenticity, I chatted with an HR Leader from a major brand who told me her desire was to hire employees who did not promote themselves but rather exhibited humility. No ninjas, rockstars or gurus there. Huh. Maybe there’s a niche for Amish HR after all.